SANTANA single video "Los Invisibles," from the upcoming Santana album, Africa Speaks, due out on Concord Records features the animated art of Rudy Gutierrez as well art for the single. The video can be viewed here. SANTANA'S 5 song EP "In Search of Mona Lisa" features the art of Rudy Gutierrez as does the video for the song Do You Remember Me? The art of Rudy Gutierrez graces the film Chasing Trane: The John Coltrane Documentary! Rudy's paintings from the picture book Spirit Seeker- John Coltrane's Musical Journey (written by Gary Golio and published by Clarion) appear in the film and his painting "A Love Supreme" is being used for the film poster as well as the DVD, Blu-Ray, CD and Vinyl soundtracks! Rudy is also featured in the DVD extras in an interview! Other interviews include Wynton Marsalis, Sonny Rollins, Dr. Cornel West, Carlos Santana, President Bill Clinton and Common, among others, Coltrane’s own words are spoken by Denzel Washington. Carlos Santana: Sound of the Heart, Song of the World picture book is out! With soaring images by Rudy Gutierrez and powerful poems, this is the breathtaking story of what became known as the Zoot Suit Riots as only Margarita Engle could tell it. The limited-edition Jimi Hendrix stamp, with art by artist Rudy Gutierrez, features a vibrant, colorful design fashioned to evoke the movement and rhythm of the late singer and pay homage to the psychedelic rock era of the 1960s. See Member Spotlight here at Altpick for Nov. 17,'03 interview. Hear an interview with Rudy Gutierrez on "Sidebar, Four Color Conversations on Comics, Art & Pop Culture" website. Art Revolution: Alternative Approaches for Fine Artists and Illustrators. If you are in Tempe, Arizona, Walnut Creek, San Diego or Mill Valley, CA go check out large prints of Rudy's art that grace the walls in the New Maria, Maria restaurants. The restaurant's ambience and environment are inspired by the music of Santana, reflecting its passion and spirit with vibrant artwork, sensuous lighting, rustically elegant decor and a palette of rich, warm earth tones. Rudy's art for various periodicals, book covers, magazines, records, CDs, and children’s books, as well as his paintings have appeared nationally and abroad. Gutierrez is perhaps best known for his iconic painting that was commissioned for the cover of the much anticipated multi-platinum smash hit recording, Santana “Shaman”. He has contributed art to the First Annual Anti- Apartheid show at the United Nations, participated in shows exploring social issues which included an exhibition at The Kassel Documenta in Germany as well as at the World Conference Against Racism in Durban, South Africa and contributed, to and Co- Curated “The Prevailing Human Spirit” Exhibition at the Society of Illustrators in NY. The show was a benefit for the victims of the tragic events of 9/11 in New York City. Rudy was also a contributor to The Education of an Illustrator and Teaching Illustration books published by Allworth Press. His art is featured in the books- Art Revolution: Alternative Approaches for Fine Artists and Illustrators and in the Star Wars Visions that showcased several artists selected by the Star Wars creator George Lucas. The award winning artist includes the Dean Cornwell Recognition Hall of Fame Award (Since 1958, the Society of Illustrators has elected to it’s Hall of Fame artists recognized for their “distinguished achievement in the art of illustration. ), Distinguished Educator in the Arts Award, and a Gold Medal from the NY Society of Illustrators and International Labor Communications Association Honor among his honors. His children’s books have garnered him a Pura Belpré Honor, Américas Book Award, Africa Access Award, Silver Birch Award Nomination and a New York Book Award. His work has been featured by Communication Arts, Step by Step, The Society of Illustrators, American Illustration, Art News, American Artist and Art Direction Magazine. Gutierrez has taught at Pratt Institute for many years as well as lectured at various colleges and institutions including workshops on the Rosebud Reservation in South Dakota, Univa- Universidad del Valle de Atemajac- in Mexico, where he was a featured speaker at the XI International Engineering Congress Presentation and at the 2005 Icon 5 Illustration Conference in NYC. He currently also teaches in the FIT Graduate Illustration Program. Gutierrez’s art has been described as “Wall Medicine”, ancient yet contemporary, urban in a sense and musical in feel. He believes that the highest honor and fulfillment is to inspire and uplift. Santana video featuring the art of Rudy Gutierrez for the single “Los Invisibles". Rudy Gutierrez's art featured in Santana video! 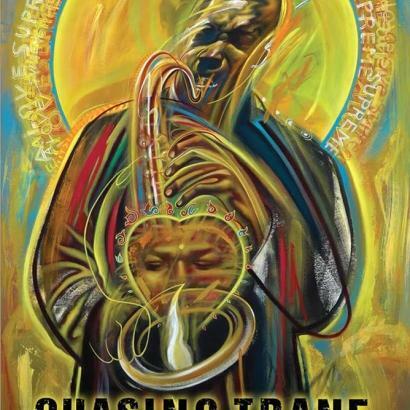 Review of "Chasing Trane" film and article featuring my work.